Urban Fantasy Novel: Into The Fire from Patrick Hester - Available Now! Samantha Kane is struggling with this thing called “her life” and how it can be turned completely upside down in the span of one week. Her partner and mentor is hospitalized, followed quickly by her father, who slips into a coma; her teenage brother decides now is the perfect time to rebel; and her mom lays the guilt on as thick as molasses every chance she gets. Work isn’t much better. Recently promoted to detective, her job is suddenly in jeopardy, and the cops she’s worked with for years no longer respect her or want her around. Not to mention the fact that Ghosts, Vampires, and Werewolves are real and apparently want her dead. According to a crazy man who showed up out of nowhere, Sam was never meant to be a cop. She’s supposed to be a Wizard. Published by – WordFire Press, an imprint of WordFire, Inc.
Patrick Hester is an author, blogger, 2013 and 2014 Hugo Award Winner, podcast producer, and all-around Functional Nerd. He writes Science Fiction and Fantasy available in several anthologies and ebooks. 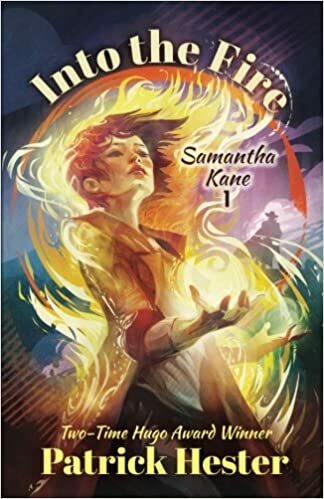 Samantha Kane: Into the Fire is just his latest novel. He is @atfmb on Twitter and Facebook, where he talks about all things writing, gaming, music and nerd-life that amuse him. He produces the multi-Parsec Nominated Functional Nerds podcast, produced and hosted the Hugo Award winning SFSignal.com podcast for nearly seven years, and produced “I Should Be Writing,” the podcast for wannabe fiction writers created/hosted by 2013 Campbell Award Winner Mur Lafferty, for several years. He maintained a twice-monthly column for the Kirkus Reviews blog for years, writes for his own sites atfmb.com and FunctionalNerds.com as well as for the Pikes Peak Writers blog and various other websites and blogs. He is a Scrivener guru and teaches several classes to writers throughout the year.